It's Friday, so like any busy worker bee, we are looking forward to celebrating the weekend with our best pals at happy hour. This week though, we want to bring the fun to your business by helping you host your own happy hour shopping event. Happy hour shopping events, sip and shop parties, open houses and the like are easy ways to promote your business to new customers, show appreciation for your existing customers, get to know your neighbors, and bring in a little bit of extra dough on otherwise slow evenings. Don't tell anybody, but wallets tend to be a little looser when you add wine. We've got the basics covered below to get you started! 1. Pick a date and a time. This will be different for everyone. Cnsider your slowest evenings and your busiest to determine the best night for your shop. Think about foot traffic in your area. If you live in an area with great nightlife, maybe you want to consider late-night or after-hours timing versus happy hour. Or if the brunch restaurant next door always has a wait on Sundays, consider hosting complimentary mimosas and mini croissants at the shop! 2. Define the audience. "Everyone I know" doesn't count as an answer. Really focus. 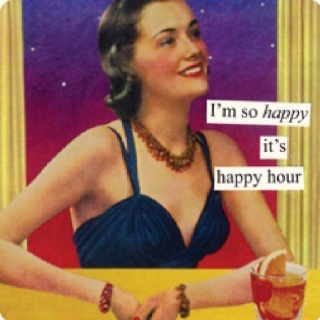 Is this happy hour primarily meant for your friends and family? Is it to encourage existing customers to spend more or give you feedback? Is it to attract new customers? Is it to build relationships with your business community? Will it be mostly men or women? Defining your audience will ensure you throw the best, most tailored happy hour you can. 3. Make a wish list of ideas. In an ideal world with an unlimited budget, what would your customers' experience look like at this event? Now, reign that in a bit, make some compromises (the chocolate fountain might not be practical) and fit what you can into your budget. 4. Barter. Now that you have your wish list, think about how you can make it happen using your contact list. The bakery down the street might love to donate some brownies to the cause if it means some extra promotion for them. And the brewery where your friend works might be down to provide beer if you help them out by letting them raid your housewares section when they need to borrow colorful props for a photo shoot. Call in favors, and return them in kind. 5. Promote. Whether you go old-school and hand-deliver paper invitations or new-school and do a full-on social media-only invitations, remember this—always under-promise and over-deliver. Not only does this manage guest expectations, but being a little vague also leaves wiggle room in case that bakery down the street brings blueberry pie instead of brownies at the last minute. Hey, we'll eat either. 6. At the event, be present! These sorts of events are perfect for making genuine connections with your customers. Don't waste that opportunity running around frantically looking for a corkscrew and trying to ring someone up and trying to Instagram all the pictures. Delegate a friend or one of your employees to be "in charge" of details that night so that you can do you. 7. Document it. Hashtag it. Put it out there. If it's not on the Internet, it doesn't have much of an impact on anyone outside the room. We recommend keeping social media posts on loose auto-pilot. Schedule a couple of general posts beforehand and then whatever you post live from the happy hour is icing on the cake. Snap pictures of your customers enjoying themselves and don't be shy about asking for their Twitter handle. People love shout outs! In addition to your iPhone skills, ask your product photographer if they'd mind snapping a few pictures for you of the event. If you have a blog for your store, share photos and a recap there. Create a Facebook album perhaps, and definitely use the best photos to share with future partners that might want to get involved next time! We hope this helps you throw the best happy hour shopping event in history. Let us know how it goes (and what you sipped) in the comments!